Ethiopia's Simien Mountains facing "out of control fierce fire"
Simien Mountains Fire is out of control, say regional authorities. Federal government has not yet responded to the emergency. Critical voices in social media tend to see the fire on Ethiopia’s two national parks in less than a week as suspicious. Consisting of Ras Dejen (also known as Ras Dashen), the highest peak over 4,530 meters above sea level, Ethiopia’s Simien Mountains in the North Western parts of the country has been one of the major tourist attractions. UNESCO called the Simien National Park, which is part of Semien Mountains, as “one of the most spectacular landscapes in the world.” The park is also known for its endemic animals the Walia ibex, Chilada baboon, and the Simien fox. News coming from the regional state since Thursday, March 28, 2019, seems to indicate that the park is facing great threat, perhaps in its history. A fierce fire is raging in the park since yesterday and it does not to be under control although there were initial reports, from the region’s Wildlife protection and conservation authority Director – Belayneh Ayele that the fire was controlled but that does not seem to be the case. Trees and grass in the park are burned. 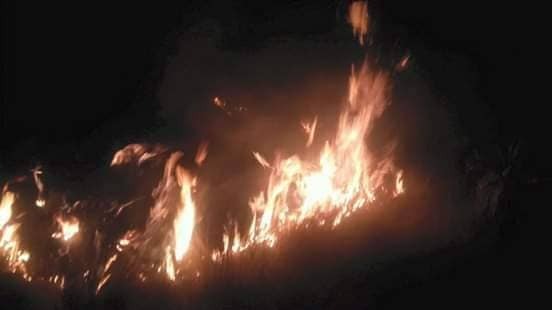 Amhara Mass Media Agency (AMMA) reported on Friday that the fire is out of control. The methods used to control the fire since Thursday was traditional ones including using water and soil, and mostly volunteer based – showing lack of coordinated emergency response on the part of government. Students, farmers and the region’s Special Forces, among others, are engaged in the effort to put out the fire. North Gonder Zone authorities have already pleaded for government support although the Federal government is yet to respond to it. Apart from lack of modern methods like Air spray using aircraft, dry grass in the park and wind have aggravated the fire. Cause of the fire is believed to be arson but no suspects are in custody so far, according to the region’s state media. This is the second wild fire in the country in less than a week. Bale National Park in South Ethiopia experienced similar situation. Skeptical politicized Ethiopians seem to see the news of fire on Ethiopia’s’ two important parks as parts of coordinated and orchestrated strategy to create another dimension of crisis in the country. One Response to "Ethiopia’s Simien Mountains facing fierce fire"
I did not get a chsnce to go to the mountain .